The attack on the offices of the satirical French newspaper Charlie Hebdo claiming 12 lives was the most closely followed news in the U.S. last week, but interest in the story was not as high when compared with four previous terrorist incidents abroad. About three-in-ten Americans (29%) say they had followed the news from Paris very closely, according to a new Pew Research Center survey. The previous terrorist attacks that had drawn the highest shares of American news interest resulted in significant numbers of casualties. One was the 2005 bombings of three trains and a bus in London that killed 52 people and injured more than 700. The second was the 2004 assault of Chechen rebels on a Russian school that resulted in more than 300 deaths, about half of them children. In both cases, 48% of Americans said they had followed those stories very closely. 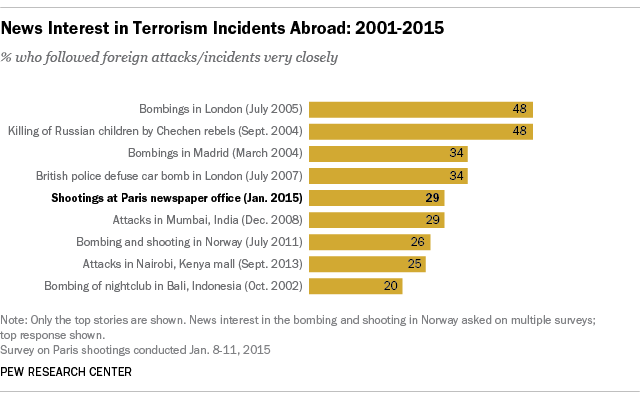 Other incidents abroad that had a higher share of news interest were the 2004 train bombings in Madrid, killing 191 people and injuring 1,800, and a planned terrorist attack in London in 2007 that was thwarted when police defused bombs in a pair of cars made with gasoline, gas cylinders and nails that could have caused a large number of casualties. About a third (34%) of Americans followed these stories very closely. Terrorist attacks that occur within the U.S. unsurprisingly command far greater attention. About three-quarters (78%) of Americans followed news about the 9/11 attacks very closely and 63% said the same about the terrorist bombing at the Boston Marathon in 2013.